Rocky Mountain Elk (Cervus canadensis nelsoni)— (Rocky Mountain West, now transplanted in other locations) — Largest antlers of all subspecies. Roosevelt’s Elk (Cervus canadensis roosevelti) — (coastal Pacific Northwest) — largest in body size. 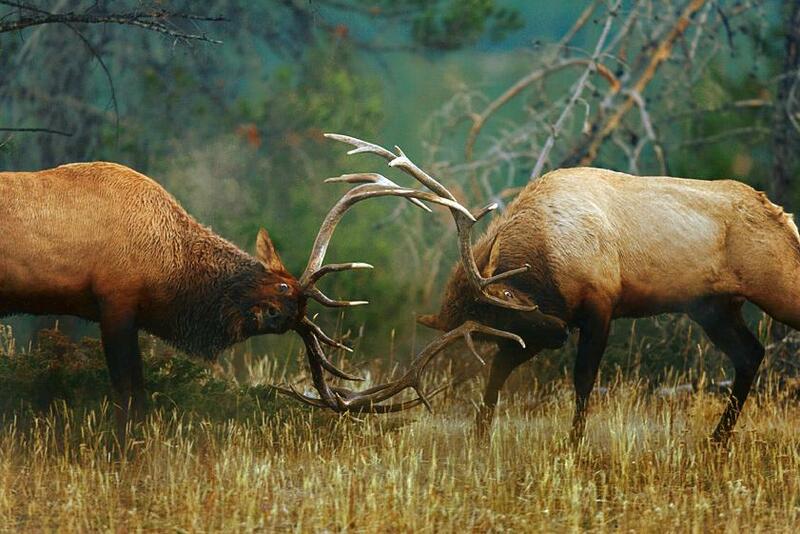 Above photo of Rocky Mountain Bull Elk by MONGO. Prior to European settlement, an estimated 10 million elk roamed nearly all of what is now the United States and parts of Canada. Elk adapted to almost all ecosystems except the tundra, true deserts, and the Gulf Coast. Today, about 1 million elk live in the western, central, and eastern U.S., and from Ontario to western Canada. As the country was settled & western expansion began, elk were slowly driven from their original range, eventually becoming totally extirpated from most states east of the Mississippi. Continued development pushed the remaining herds to their last strongholds in the mountainous terrain of the western Rocky Mountain states and Pacific Northwest. Some estimates place the total number of elk as fewer than 50,000 at the turn of the century. Above photo from www.SaveBulletsShootArchery.comutilized in accordance with Fair Use. A shining example of the partnerships between game and fish departments and private organizations is Kentucky’s efforts to reintroduce elk. In 1997, the Kentucky Department of Fish and Game, along with the financial support of the Rocky Mountain Elk Foundation, transplanted seven elk from Kansas into a 16-county restoration zone. This land area, which is approximately 4 million acres with more than 476,000 acres of public access, is roughly the size of Yellowstone National Park. From 1997 to 2002, 1,500 elk were transplanted from Arizona, New Mexico, North Dakota, Oregon and Utah. In 2001, the elk herd had grown to the point where a limited hunting season was held. Ten permits were issued that year, and the first wild elk in more than 150 years was harvested. Bull elk can produce 22 to 24 pounds of antler velvet annually, and ranches that raise elk commercially collect and sell the velvet to East Asia where it is used in medicine.